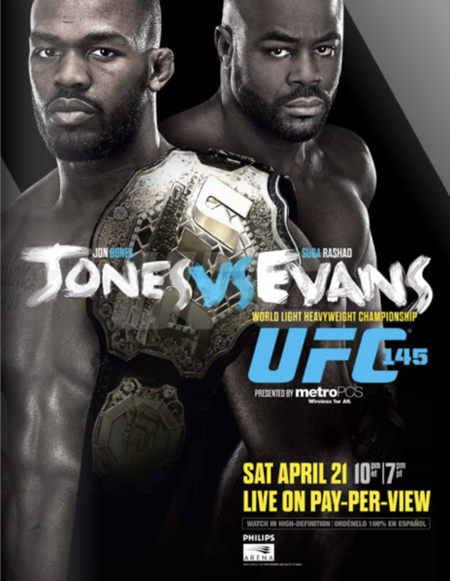 Everybody already knows “UFC 145: Jones vs. Evans” takes place April 21st inside Philips Arena in Atlanta, Georgia. However, what time does the action kick off and where can fans watch the fights? Funny you should ask, because we’ve obtained all of the pertinent information for your convenience. The UFC’s Facebook page will start things off by streaming three preliminary bouts live at approximately 6:30PM ET/3:30PM PT. FX will then air the card’s remaining four prelims at 8PM ET/5PM PT. The pay-per-view broadcast begins immediately after the freebie fights at 10PM ET/7PM PT. A light heavyweight title tilt between champion Jon Jones and bitter rival Rashad Evans headlines the extravaganza. Welterweights Rory MacDonald and Che Mills will serve as the night’s co-main event.